Home made meat pies are so much tastier than the shop bought ones and can easily be frozen ready for a quick family meal. The meat used for a pie filling needs to be pre cooked before being put into the pastry case and the meat also needs to be tender. Use lamb, pork or beef that you would purchase for casseroles and cook it in bulk in the oven until ready to eat. Allow it to cool before placing in the pastry case as otherwise the filling will melt the pastry before it is cooked. There is nothing wrong with adding vegetables to your meat for tasty alternative pie recipes. Most pie recipes will use a short crust recipe but pies that just have a top to them can also have a puff pastry that looks very attractive when serving to guests. You are either good at pastry making or not – some people seem to have the knack. 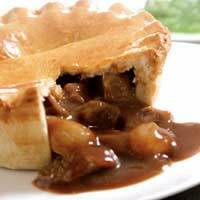 For ease and for perfect pies every time why not use the pre made pastry that is available either fresh or frozen from every good supermarket? You can even store this in your freezer ready for when you wish to make a meal. Price wise there is hardly any point in making your own when ready made varieties are so cheap and easy to obtain. When baking pies always make an egg wash by beating one raw egg with a little milk. This can be used to stick layers of pastry together and to brush over the pie before placing in the oven for a professional looking shiny brown crust. Never overfill your pie cases as the contents will spill out of the pies when being cooked and not only make the pies look unappetising but will mean you have the task of cleaning your oven after use as well. There are a variety of meats that can be used for filling pies, here are some ideas. Heat oil in pan and add the onion, cook until clear. Add the steak and kidney to brown, Next add the herbs, stock cube and enough water to cover meat and simmer until tender. Thicken the liquid with cornflour or granules. A thicker gravy is better for the pie filling. Any remaining gravy could be frozen separately to accompany the meal when it is served. Heat oil in pan and add the onion, cook until clear. Add the chicken thighs and cook gently so the meat does not break up. Add the sweetcorn to heat through. Next add the stock cube and can of soup plus season. Simmer for twenty minutes. Prepare as for the steak and kidney recipe using 500 g of minced beef. Prepare as for the steak and kidney recipe replacing the meat with 500 g of diced pork and use a vegetable stock cube. Add two peeled and chopped eating apples as the meat simmers. A sweeter apples such as a cox is best for this filling. Prepare as for the steak and kidney recipe exchanging the beef for 500 g diced lamb and adding three washed and sliced leeks at the same time as the onion is cooked. When fillings are cooled roll out a pack of short crust pastry on a floured surface to a depth of one quarter of an inch. Place your pie dish onto the pastry and cut around for the shape – this is the lid. If the pie dish is not non stick grease it with a little smear of butter before easing the pastry into the dish and cutting any excess from the rim. Add your filling and brush egg wash around the pastry rim. Place on the pastry lid then using your thumb press down evenly around the rim of the pie to seal the two layers together. Cover the top of the pie with egg wash and pierce a hole in the pastry for the steam to escape. You can decorate the top with scraps of pastry at this stage. Family sized pies on pie plates look very appetising however by making individual pies you can cater to your families different tastes and also be prepared for single meals as well. Note: You could make the fillings ahead of baking and slow cook the fillings in a low oven then make all the pies at the same time in the oven.